When it comes to home decorating, second to furniture, we mostly discuss what we will hang on our walls. Considering that the average height of a wall is eight feet, that’s 32 feet of empty space in one four-walled room that needs to be filled! With higher ceilings and open floor plans, feeling the need to fill wall space only increases. However, it’s very easy to fill your walls up so fast and with so much, they end up looking like a cluttered and chaotic disaster. Start with the main wall of the first room that your guests view when they walk in your front door. Therefore, if your living room opens to the side, begin with the opposite wall or the wall opposite the front window. If your kitchen resides straight ahead, work with the wall straight ahead. Consider hanging one item on that first main wall. This way, all attention will be focused on this cherished item, and the wall will not look cluttered. 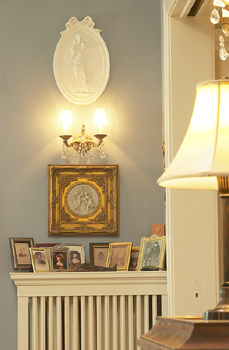 You can even add a lighting fixture to center extra attention on the piece of art. Create a triangle of space on the wall that you will allow yourself to fill. Try to center it and keep it no larger than the top half of the wall. Fill this triangle of space with a collage of items, and do not extend the décor outside of the triangle. Continue following these rules as you continue to decorate past the main room of the house. Keep a routine going by hanging one centerpiece in each room, or mix it up, with some rooms showing off collages or multiple pieces, and other room displaying one focal piece. Who will use the room the most? What type of ambiance do you want the room to have? What color patterns do your paint palettes and furniture provide? What other wall items are you working with, such as windows and fireplaces? What is your decorating budget? What you hang on your wall is entirely up to you. The possibilities are overabundant, with almost nothing considered taboo. You could hang a family portrait or a collage of photographic memories. You could hang a piece of renowned artwork as a main focal point, or you could hang multiple pieces of art that complement each other. You could skip the usual paintings, sketches and photographs, and opt for a collage of wallpaper patterns, a framed puzzle, a creative piece of wood, a sculpture, an intricate clock or any other type of object that you find inspiring and visually appealing. Once you find a decorative piece that you want to show off, strive to keep the focus on that piece and to keep your walls as uncluttered and calm as possible. Your guests will appreciate your smart sense of style!